Isis members Arthur, Phil, Simon, Penny, Ian, Helen, Charlotte, Anna & Jessica paddled the scenic 12 miles last Sunday from Lower Lydbrook to Monmouth. After a reasonably early start at the scouts we managed to get on our way at 8.45, we made our way to Monmouth firstly dropping off Helens car for the shuttle vehicle to get the drivers back to the start. Phil met us at Lower Lydbrook car park where we changed and prepared for the days paddle,the river was well up and flowing reasonably fast which meant that most of the smaller rapid drops as we went down were submerged so it wasn't quite as interesting as normal but the flow of the river was new to some of the paddlers, Jessica found that bridge piers are to be kept well away from but luckily managed to manouvre round the obstacle without incident. 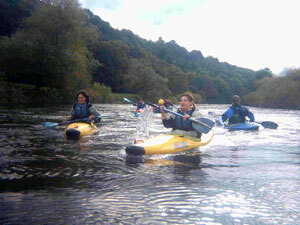 We made our way pleasantly in the sunshine to Symonds Yat where Simon and Anna had a go at seal launching from the side of a huge rock into the river a popular place in the summer to practise seal launching. We stopped for lunch around 1pm at the Ferrie Inn only to find that it had closed down once we were all ashore, so no beer there for Phil, he paddled on ahead after we restarted and caught a quick pint at the Saracens Head on th oppisite bank from the Ferrie Inn and half a mile further downstream. Everyone shot down the Yat rapid which was choppy and fast but without any stoppers successfully, it can be a bit tricky at lower water levels, from there we made our way down through the Biblins, rapids submerged, to Monmouth still in sunshine, the forecast had been for showers all day but we were glad it stayed fine with the brisk wind behind us. We finished arriviving at Monmouth steps at 3.45 where we went back for the vehicles and got changed, loaded up and set off back to Oxford, I hope everyone enjoyed the run it has allways been a favorite of mine since the early seventies when I was stationed at Chepstow. Am hoping the everyone will be able to do another similar distance on the upper Wye from Builth Wells to Glasbury on the 21st Nov, more rapids not as big as the Yat and a weir to shoot if you wish, watch out for details from Penny.